Texas Housewife: Celebrate America Airs Tonight! I wanted to share with y'all about Celebrate America, a wonderful special featuring some amazing Texas high school choirs. It airs tonight at 7:00. Tune in to listen to some beautiful music. It is great family viewing! My little cousin Katie is one of the talented students singing tonight, so we will definitely be watching. 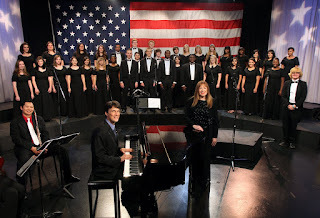 DALLAS/FORT WORTH: High school choirs from across North Texas will be featured in the new public television special Celebrate America, produced by internationally-renowned composer Tim Janis. Celebrate America with Tim Janis airs at 7:00 p.m. Monday, March 15 on KERA-TV. The program was recorded at the KERA-TV Studios in October 2009. With millions of albums sold, five national public television specials, and 10 Billboard charting CDs, composer Tim Janis has worked with some of the top artists in the music and entertainment business -- from Paul McCartney, Billy Joel, and Ray Charles, to George Clooney and James Earl Jones. Musician, conductor and arranger, Janis’ story is one of deep belief in the power of creating music that can heal and bring peace on a global level. His music has traveled to from New York City to Africa, China and Eastern Europe. With millions of listeners and thousands of testimonies Tim continues to bring to the world a universal message of hope and peace. KERA is a not-for-profit public media organization that serves the people of North Texas. The station broadcasts to the fourth-largest population area in the United States. KERA produces original multimedia content, carries the best in national and international public television and radio programs, and provides online resources at www.kera.org. The station’s extensive coverage of the arts can be found at www.artandseek.org. KERA-TV broadcasts on Channel 13.1. KERA WORLD broadcasts on 13.2. KERA-FM broadcasts on 90.1 in Dallas/Fort Worth/Denton, 88.3 in Wichita Falls, 100.1 in Tyler and 99.3 in Sherman. KXT 91.7 FM, KERA’s new music station, is streamed online at www.kxt.org. Hope you had a great spring break and look forward to seeing some posts from you again. TAG! Check out my blog if you are interested in playing along.